Fuchsias are technically perennial plants that will return year after year in tropical and sub-tropical climates. However, they are commonly grown as annuals in colder climates where winter freezes kill the plants. Fuchsias come in different colors and varieties, some of which can grow as tall as 6 feet or as small 1 foot. Choose an area that is partially shady. Ideally an area that receives morning sun, afternoon shade and then evening sun again is best. Many fuchsias have large flowers and are fragile, such as “The President” and “Pink Galore” varieties. Therefore, avoid areas that receive a lot of wind for these types of fuchsias. 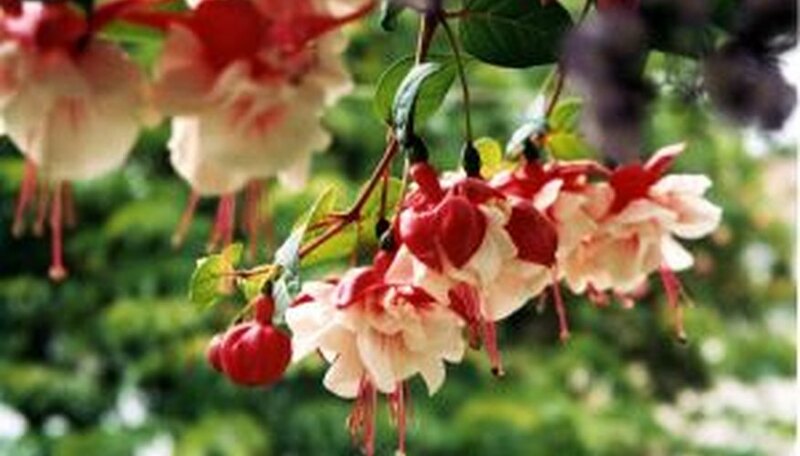 However, fuchsias such as the “Magellinica” varieties can withstand wind, including coastal winds. Plant in soil that is well draining in late spring, generally in May. Till the planting bed and add sand, compost or peat moss to the soil if needed to loosen the soil for better drainage. In addition, add a couple handfuls of bone meal (fertilizer) to the soil per square yard. If you are planting in a container, general all-purpose soil will suffice. Dig a hole twice the size of the root ball. Place the plant in the hole so the stem of the plant is at the soil’s surface; however, if you plan to keep them over winter in areas that have mild winters, plant them about 2 inches below the ground. Fill the soil back around the root ball, and tamp it down to avoid air pockets. Place a stake next to a young fuchsia if necessary. Most fuchsias are self supporting, so look at the label that came with your plant to see if it needs a stake. Water it well. Plant fuchsias at least 12 inches apart. Read the label for specific spacing for your fuchsia variety since some can grow as wide as 5 feet. If you are planting in a hanging basket, plant one per container.